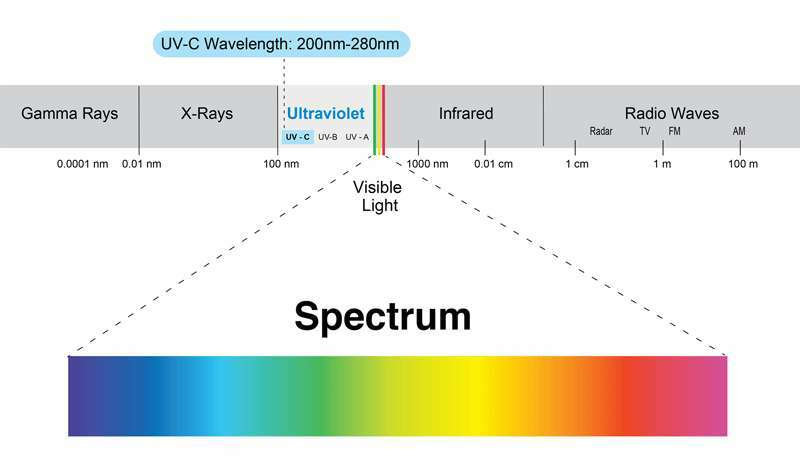 Ultraviolet light belongs in the electromagnetic spectrum with a wavelength in the range of 200 to 400 nm (nanometers), which is shorter than that of visible light, but longer than X-rays. All UV rays and bands are invisible to the human eye. UV-A (long-wave; 400 - 315 nm): used for black lights, skin tanning, ink/resin curing. UV-B (medium-wave; 315 - 280 nm): used for psoriasis therapy, can cause sunburn, skin cancer. UV-C (short-wave; 280 - 200nm): most effective for germicidal disinfection. UV-V (vacuum UV, below 200 nm): can produce ozone in the air. All the above wavelengths of UV light are emitted by the sun, but only the longer wavelengths, UV-A and UV-B reach the earth. The UV-C rays, which are the shortest wavelength but highest energy are blocked by the ozone layer. Since UV-C rays are blocked by the ozone layer, microorganisms have not developed a natural defense against UV-C energy. When the DNA of a microorganism absorbs UV-C energy, molecular instability occurs, resulting in the disruption of the DNA sequence. This renders the cell unable to grow or reproduce. Without the ability to reproduce, the cell cannot infect and it rapidly dies. The application of UV-C energy to inactivate microorganisms is known as Germicidal Irradiation or UVGI. It has been used for this purpose since the early 1900s. Artificial UV-C energy is produced in germicidal ultraviolet lamps which produce UV radiation by ionizing low pressure mercury vapor. These lamps are similar to typical fluorescent household lamps, but do not have the phosphorescent coating which imparts the soft white light. Most commercial UV-C lamps are low pressure mercury lamps that emit UV energy at 253.7 nm, which is an ideal wavelength for disrupting the DNA of microorganisms. UV-C lamps and devices are being increasingly used all over the world in various configurations and applications to disinfect water, air and surfaces. Dosage is what determines effectiveness! The amount of UV-C energy needed to inactivate a given microorganism is measured by dose, which is determined by a combination of irradiation energy and exposure time. A key difference between surface inactivation and airstream inactivation of micro-organisms is exposure time. Residence time in the UV field for microorganisms in the air stream is in the order of seconds and would require a much higher UV-C dose as compared to a surface application. Scientists have determined the rates at which various microbial populations decline due to exposure to biocidal factors such as UV-C irradiation. Organisms differ in their susceptibility to UV-C inactivation; in general, viruses are the most susceptible to UV-C followed by bacteria with molds and fungal spores being the least susceptible. 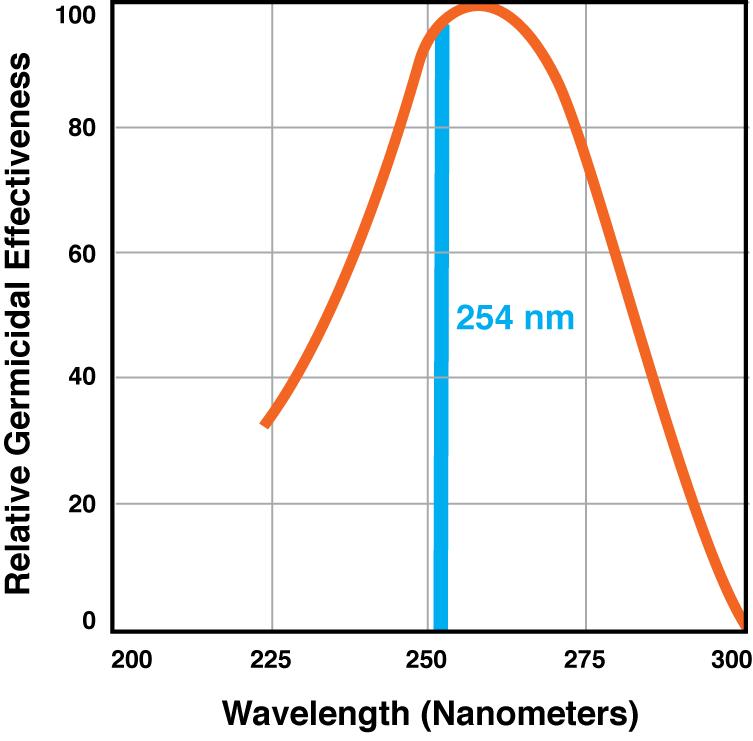 UV-C irradiation also obeys the inverse–square law of light, where the intensity at a given point is inversely proportional to the square of its distance from the light source. Prolonged exposure to UV can cause photo degradation of organic and synthetic materials. Owing to the short wavelength, UV-C transmissivity tends to be very low for most materials; therefore, most of the photo degradation may occur only on the immediate surface of a material, and/or manifest itself as fading or discoloration. The degree to which an object might be susceptible to UV degradation needs to be considered in any application where exposure may be prolonged. Ultraviolet germicidal irradiation used for water, air and surface disinfection is biocidal to microorganisms but presents a health hazard to humans as well. Excessive exposure to UV can result in damage to the eyes in form of photo keratitis and conjunctivitis. These symptoms usually appear within 6 to 12 hours after UV exposure and resolve within 24 to 48 hours. Ultraviolet radiation exposure can also affect the skin and cause erythema (skin-reddening). Most of the UV-C gets reflected and absorbed by the outer dead layer of the human skin, thus minimizing the UV-C transmitted through the epidermis layer. CDC and NIOSH have recommended permissible exposure limits for different UV wavelengths. For UV-C, at 253.7 nm wavelength, the recommended exposure limit (REL) is 6 mJ/cm2 for a daily 8 hour work shift. The use of proper personal protective equipment (PPE) is recommended when personnel may be exposed to UV radiation. Kowalski W (2009). Ultraviolet Germicidal Irradiation Handbook, UVGI for Air and Surface Disinfection, Springer-Verlag, Berlin. Bolton J.R, Cotton C.A (2001). Ultraviolet Disinfection Handbook, American Water Works Association, Denver, CO. Harm W (1980). Biological Effects of Ultraviolet Radiation, New York. Cambridge University Press. ASHRAE Handbook (2016). HVAC Systems and Equipment, Ch. 17. Ultraviolet Lamp Systems. Shechmeister I.L (1991). Sterilization by ultraviolet radiation. Disinfection, Sterilization and Preservation, pp. 535-565. ACGIH (2015). Theoretical Limit Values and Biological Exposure Indices, Cincinnati Ohio. NIOSH (1972). Criteria for a recommended standard: Occupational exposure to ultraviolet radiation. Publication 73-11009, Washington D.C.
Kauffman R (2011). Study the degradation of typical HVAC materials, filters and components irradiated by UVC energy. ASHRAE Research Report RP-1509. IESNA (2000). Lighting Handbook: Reference & Application IESNA HB-9-2000, New York.